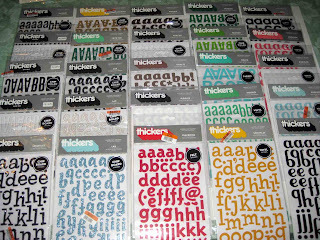 Being the Thickers sticker addict that I am, I was absolutely thrilled to discover that Big Lots had a batch of these for $2 each. They originally retailed for $5 at Archivers. I hit the 3 Big Lots in New Albany, Clarksville and Jeffersonville and then decided that Friday I would go on a Thickers expedition to Louisville. I managed to hit 4 more Big Lots (and 1 thrift store) in the time alloted. Considering they were all over that place, I think I did pretty well. I scored big at all of them! Each one had different sets, some had a few of the same but it was definitely worth going to them all and I bought some multiples of my favorites! I love the different textures- foam, vinyl, fabric, felt, chipboard, etc! I shopped for mom too so she is now well stocked in the Thickers dept too! Yay for Thickers and Big Lots!